Welcome To THE Turbocharged A-Series Resource! Feel free to stop by our Turbomini Forums, upload a picture of your engine or shiney bits, add details about your car, or just read about why we are here! Think you've got the most power? Long time forum member and sucker-for-punishment John Harper has decided to organise a Rolling Road Shootout followed by a Santa-Pod Run-what-you-brung day on the weekend of the 1st of October, 2011. If you would like to get involved, or just want some more information then check out the rolling road shootout thread in the TM forums. Come and prove your power and speed to us all! British Mini Showdown - Who Will Win? Yet again the first half of the year has flown by, and Avon Park is upon us. Who's going to win this year? JohnK in his BMW K1100 Turbo, Carl and Tom with the DON, or any of the other awesome cars on the forum such as Nic with his red rocket or Matt Woods with the famous Mini Williams car? It looks set to be a great weekend of mini fun, and we're hoping that the forum can keep the Class D title for another year! Sea, Sun and … Boost? This update is a small reminder for all you Turbo Mini fans. Next weekend is the annual Mini World Riviera Run, where hundreds of minis convoy down to Newquay to get together, drink, and enjoy the now probably famous mini show on the Sunday. There is also autocross for you wanna-be racers. There are plenty of TurboMini Forum regulars going, so probably a plethora of quick minis to gaze upon. For more information buy this month's Mini World magazine! See you on the beach! Well, the site has been live for about 2 weeks now and our faithful users have uploaded some great content. 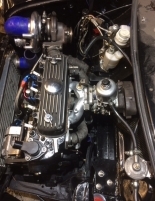 Hughesmarkie posted his Turbo Mini Project which has a huge spec, a neat engine bay and an inventive way of mounting the intercooler. 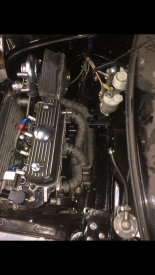 Site co-founder Iain uploaded a whole load of pictures of his Turbo Miglia, a real race car for the road. Nick's mini clubman is looking great, and a big step away from his old matt black minis. Theoneeyedlizard added his car, Darth. A stunning project with a good spec and plenty of great pictures to check out. There are now over 30 cars to look at, and don't forget you can add your own too! Of course our members can add photos too! We've had loads of pictures uploaded, such as a Turbo Mini, plenty of fresh engines, worked heads, turbo mini projects, better halves, paint jobs, race cars and I don't even know where to start with this one. Welcome to the new Turbominis! Welcome to the new Turbominis website, probably the best resource for your Turbo Mini on the internet. We've been working hard to create what we think is the best version of the site yet. The very generous members of our forum put their oily little hands into their overall pockets, and donated enough money to upgrade to a big fancy server, and we thought it was only right to give something back! The new site has many features, some of which are similar to the old site, and some are new. Logins are now linked to your forum logins. A single login means you don't have to re-register on the main site, and means we can add features later on that link the forum to the site. You can still upload photos and they can now be commented on other members of Turbominis. In addition to this, we've added Tags to photos, to help sorting and searching. We've also added Car Blogs. You can add your own cars, upload photos, and keep a web-log of any changes or happenings with the car. Again, users can comment on these too! Also, we've give you your own section of the site. Once registered, you will have your own url where people can see Mine is http://www.turbominis.co.uk/alexb. After logging in you can access this page by clicking My Turbominis. We've still got lots of features in the pipe-line. The most important and most imminent is the ability to upload videos in a variety formats and allow people to comment on them. If you have any suggestions for or comments about the website, please contact us.